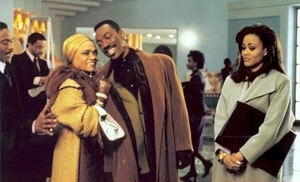 Reginald directed the dream cast of Eddie Murphy, Halle Berry, Robins Givens, Martin Lawrence, David Alan Grier and Chris Rock in the quintessential black romantic comedy. FO REAL THO: After working together in HOUSE PARTY and BOOMERANG and with the encouragement of Reggie and Eddie Murphy, Martin Lawrence decided to cast Tisha Campbell as his wife in his soon to be sitcom MARTIN. How is Eddie Murphy playing a role in a new push to diversify ad agencies? Former agency account exec Lincoln Stephens is both an example and an evangelist of the “Boomerang” effect. Stephens abruptly quit his Chicago agency job, moved back to his hometown of Dallas and, on a shoestring budget, launched a program to recruit, train and motivate talented African Americans for advertising agency jobs.